I recently dove into the new Sapphire Series of Blu Ray releases with BRAVHEART. It had been a few years since I watched, what has become, a true classic piece of cinema. It certainly was a treat to see Mel Gibson's film in such high quality at last. In this presentation the photography of John Toll is even more stunning and to listen to the score was like falling in love with James Horner's music all over again. By the way, even if you have the VHS or DVD releases of BRAVEHEART, I highly recommend you take the triple-dip and get this Blu Ray. Now, as so often happens, when I have one of those true "movie experiences, the original score from that film works its way into my head (if not my very soul) and I can't stop listening to it, humming it, or plunking it on piano. Such is the case everytime I see BRAVEHEART. After I finished charging the fields of Bannockburn, I got to thinking about how fantastic JAMES HORNER'S work was back in the 1990s...truly this man's golden era. I have had many discussions with movie and film music fans over the years on what is Horner's all-time best effort. Needless to say, there is rarely a concencus #1. Still, there are a handful of Horner scores that usually fill out the top few spots on most fan's lists. While I could easily put together a top 20 list, I've widdled it down to my (current) top 10. So take a look below...I'm thinking there will be a few surprises for you in the list. This score doesn't get talked about much these days, but it has all the romantic-goods you could want for such a film. THE MASK OF ZORRO contains many of the well-used (or well-worn) Hornerisms that seem to irritate some: the shakuhachi bursts, the four-note-menace-motif, and the lot, but in terms of a solid listen from start to finish, THE MASK OF ZORRO is one his best. Plus, if Horner can integrate flamenco dancers into the soundtrack, there's no way I can leave it off this list! You may not remember THE ROCKETEER all that well, but you likely know the main theme. Horner's title theme was poached countless times in the mid-nineties for use any movie trailer that required an uplifting and inspirational vibe. James Horner was able to capture the awe and wonder of flight and delivered a score perfect for a hero-film of the Nineties (You know, before heroes had to be all dark and serious?) Balancing out his memorable title theme came a grade-A love theme and thrilling action cues. If you haven't listened to THE ROCKETEER in a while, dust it off and give it a play. I'm betting you thought this title would end up higher in the list. Didn't you? Now, let it be known that I am not a Titanic-hater. I loved the movie in 1997 and still do. I, like so many, listened to the score incessantly (Admit it. You did, too. ), back in late 1997 and perhaps we burned out a bit on it. However, if you go back now and listen, you'll likely rediscover James Horner's original brilliance again. His score for TITANIC certainly played a significant role in the becoming the highest-grossing flick of all time and finally garnered him an Oscar. If there is one James Horner score that stands out from the crowd, it is his work for the1989 film, GLORY. Horner's employment of the Boys Choir of Harlem was a stroke of genius and makes the climactic scenes of this film unforgettable. His collaboration with director Ed Zwick would go on to produce a couple more of my top Horner picks as well! 1995 might have been James Horner's best year ever. I'd put that year up against any other single year of any other composer without hesitation. Both Apollo 13 and Braveheart were duly nominated for Oscars, but, as we know, neither won. Horner's adventurous romp is filled with all the feel-good-Americana and tension you could hope for and ends with some of the best end-title-music you'll find - featuring the memorable vocals of Annie Lennox. After Jerry Goldsmith's musical reinvention of the franchise in Star Trek: The Motion Picture, one would think that the producers would be all set for the sequel when it came to the music. Instead, they re-invented again and this time with James Horner delivering what some consider the best of all the Star Trek film scores. Hard to follow Goldmsith's act, but Horner does just that, infusing his own sci-fi/fantasy style found in previous works such as BATTLE BEYOND THE STARS or KRULL. Hard to imagine Kahn Vs. Kirk with any other style of music behind it. I can hear some of you now. "Wuhthufuh?" SEARCHING FOR BOBBY FISHER is a personal favorite of mine. I've loved it since 1993 and never tire of it. Of all his quaint and human scores such as: DAD, THE MAN WITHOUT A FACE, TO GILLIAN ON HER 37TH BIRTHDAY, this score stands supreme. So simple in its construction, yet there is something sublime that lies underneath. Horner poured something special in there that I cannot quantify. Sure. There are other Horner efforts that offer more variety, but few with more depth. Ah. Just saying the name evokes feelings of nostalgia and images of the majestic mountains filled with forests of changing leaves. That and a few hearts being cut out...literally and figuratively! The unforgettable imagery of cinematographer John Toll was duly matched by James Horner's sumptuously romantic score in LEGENDS OF THE FALL. From the inner turmoil of the Ludlow family, the ill-fated romance x 3, Tristan's wild ruggedness, to the perils of trench-warfare, James Horner's music underscores every moment of this film perfectly. The emotional content of this score just overflows and I have little doubt that LEGENDS OF THE FALL had a huge influence on Horner being selected for the film that comes in at #1 . . .
You were expecting...Willow or something? James Horner's work for BRAVEHEART drops into either the #1 or #2 position on my list at any given moment. It's an incredible work. There's no doubt in my mind (nor in the mind of dir. Mel Gibson) that this score should have brought home the Oscar in 1996. Losing to Luis Bacalov's IL POSTINO remains one of the Academy's biggest blunders to date. Having two scores in the running that year, certainly didn't help his cause either. Regardless of such award faux-pas, the impact of Horner's work on the "gift of the thistle" scene, or "Robert the Bruce's betrayal" or "The execution" scene can hardly be overstated. Each of these scenes are a part of that small group of transcendent film-moments and due credit must be given to Horner for his contribution. So there you have it - my current top ten James Horner scores. You agree? Disagree? What's your top 10? I would put Enemy at the Gates and A Beautiful Mind in there somewhere, and take out, well, Bobby Fisher and Rocketeer. Just me. Wow, just listened to your clip of Bobby Fisher. You've changed my mind. How come I don't remember it being that good? Thanks. I'm glad you came around on Searching for Bobby Fisher...'cause it will never leave my top 3! :) Give the full soundtrack a listen again. There's something deep in there. I tell ya. Huge fan of Horner myself. Interesting top 10. How did you come up with a top 10 of Horner's work? I thought such a task would be impossible. My favorite score by Horner is one that falls outside your top 10. It's the Perfect Storm from 2000. I'm simply madly in love with that score. I love the themes in Land Before Time. That one is so magical. The pop song song is atrocious but other than that. and Willow is good too. It is good to be reminded of all that Horner has done that we can appreciate. I have been collecting film scores for nearly 30 years. I have a very special place for James Horner in my heart and my collection of well over 2000 soundtracks. However I have to include/suggest not only some that should be on Horner's top 10 but some of my personal favorites of all time. BRAINSTORM - 'Michael's Gift To Karen' is one of the most beautiful pieces for piano I have ever heard. COCOON - The track 'The Ascension' is absolutely sublime. ALIENS - Incredible score - Interestingly another follow-up score to Goldsmiths 'Alien'. DAD - a very subtle and personal favorite. FIELD OF DREAMS - a haunting and inspirational mix of melancholy and joy. I believe James Horner along with Williams and Goldsmith defined an entire era of film music, and wether you love him or not he has made an indelible and powerful mark on the history of motion picture scores. I will put A Beautiful Mind, Willow and The Perfect Storm in that list. Probably I'll leave Rocketeer out. 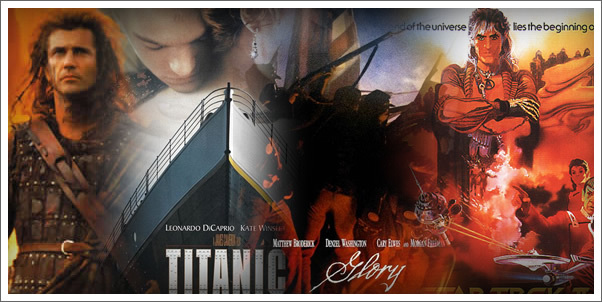 Braveheart is good but I think Titanic should mount the top (especially for 'Hymn to the Sea'). I might put Glory and Braveheart in at the top spots. The track "Preparing for Battle" brought tears to my eyes.